Here we go with the first round of "graduation-required" testing for HIGH SCHOOL STUDENTS ONLY. Please be sure your child gets plenty of rest, comes to school prepared and has a mindset to "Ace those State Tests!" Our teachers have our students prepared and ready to go. It is time for them to show up and show out! 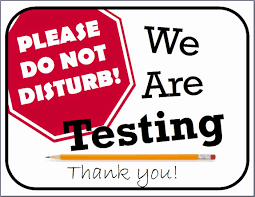 Check with your child's school for specifics on testing schedules.